Re-excision rates after breast conserving surgery (BCS) of invasive lobular carcinoma (ILC) are high. Preoperative breast MRI has the potential to reduce re-excision rates, but may lead to an increased rate of mastectomies. Hence, we assessed the influence of preoperative breast MRI on the re-excision rate and the rate of mastectomies. We performed a retrospective cohort study of a consecutive series of patients with ILC who presented in one of two dedicated tertiary cancer centers between 1993 and 2005. We assessed the initial type of surgery (BCS or mastectomy), the re-excision rate and the final type of surgery. Patients were stratified into two groups: those who received preoperative MRI (MR+ group) and those who did not (MR− group). In the MR− group, 27% of the patients underwent a re-excision after initial BCS. In the MR+ group, this rate was significantly lower at 9%. The odds ratio was 3.64 (95% CI: 1.30–10.20, P = 0.010). 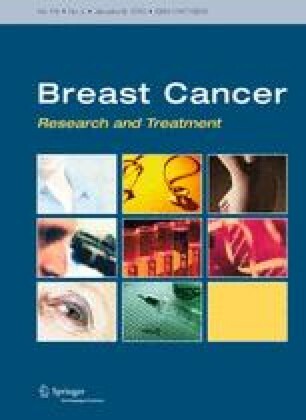 There was a trend towards a lower final mastectomy rate in the MR+ group compared to the MR− group (48 vs. 59%, P = 0.098). In conclusion, preoperative MRI in patients with ILC can reduce re-excision rates without increasing the rate of mastectomies.